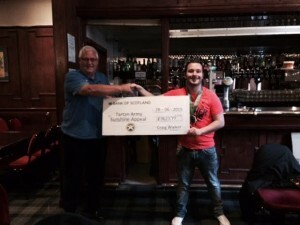 Many thanks to Stanley Athletic from Paisley for their donation of £520 that they raised at their recent fundraiser. Bobby Hewitt of Stanley Athletic and WESTA handed over the cheque to the Sunshine Appeal at the Iron Horse Bar in Glasgow. 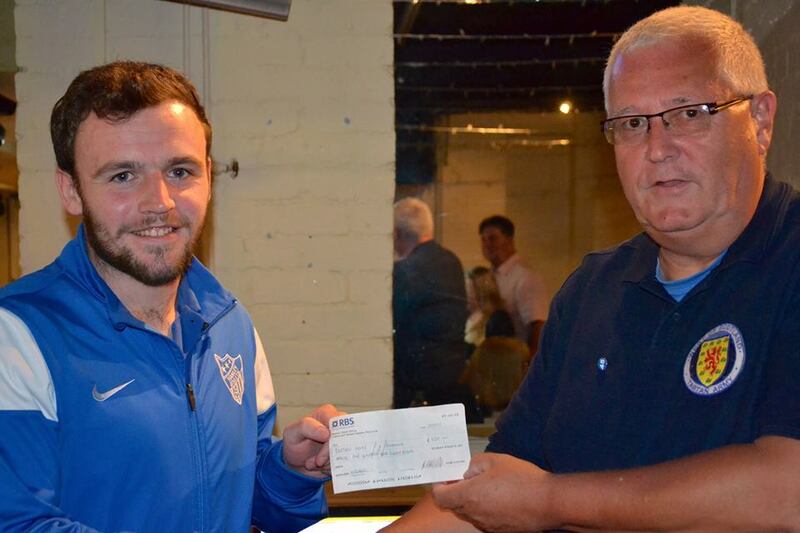 Chairman of TASA, John Daly, receives the cheque from Bobby Hewitt. On the morning of 7th July (Tuesday) at the Royal Hospital for Sick Children in Glasgow, the Tartan Army Sunshine Appeal handed over six “chemo ducks” to Sister Jean Kirkwood, the Ward Manager. 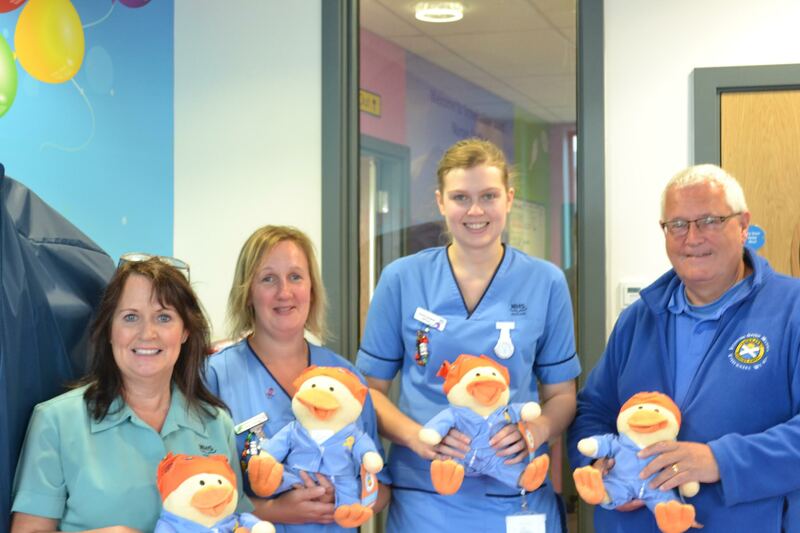 The “chemo ducks” were a gift to the hospital from Aoibheaan’s Pink Tie, a children’s cancer charity in Dublin who themselves were the recipients of a £5000/€7000 donation from the Tartan Army Sunshine Appeal when the Scots were over in Ireland for the Euro Qualifier match in June. Sister Kirkwood said, “We are extremely grateful to Aoibheann’s Pink Tie for this gift. It’s true that concern for children fighting cancer knows no boundaries and it’s great to see football being used as a vehicle to bring fans of countries together in this wonderful cause. Whilst we will be continuing to use our own “chemo cows”, these were a very welcome one-off gift from Ireland”. A year or so ago I was overweight and couldn’t run the length of myself. A bit of an achievement considering I’m only 5ft 4! I decided I needed to do something so took up fitness and just fell into doing some running. I enjoyed challenging myself to run further or faster or complete things I’ve never managed to do before. I’ve always been a supporter of the Tartan Army Sunshine Appeal, I have read of the great work it does and how much it helps the charities it donates to. We as Scotland fans are extremely fortunate to travel the world watching our beloved country play football and a lot of the time while sitting in bars and city squares we are a million miles away and don’t give a thought for those less fortunate than ourselves in the country we are guests in. I have been to a couple of TASA presentations and although it is a magical experience seeing the smile on the children’s faces, it really does hit home that although the donation from TASA will make a difference to these children’s lives, there is so much more we can do. That was when I decided I was going to do something to help TASA do the work they do. I had ran a 5k then, around 3 miles but decided to sign up for the big one and try and put myself through a marathon just over a year later. There was only one city to do it, Paris. Scene of the greatest Scotland game many have seen and McFadden’s goal and one of the most picturesque cities in the world. I had big aims for the fundraising and set myself a goal of £3000. I didn’t think I would raise the lot purely off sponsorship so held a quiz night to start with to start the year of fundraising. Over the next year I set myself an ambitious training plan to go along with my fundraising plan and put myself through the physical and mental torture that brought with it. Training was hard but I got through it, I ran round every football stadium in Glasgow in a day, I took my training to Oban on holiday with me and ran half marathons in Glasgow and Alloa to prepare. The day itself was fantastic, it was an experience I will never forget, my legs certainly won’t! I had been injured in the build up to the race and was in quite a bit of pain from about half way. My race video tells its own story, but I was determined to get to the end, my pain was nothing compared to the pain of those the money helps so I could get through it. I completed it in 5hrs 42mins, not the fastest but that didn’t matter, I crossed that finish line proudly wrapped in a saltire. It was an amazing feeling and one I will never forget. In the end I Raised £3623.77 a fact much more important than my time or my achievement.